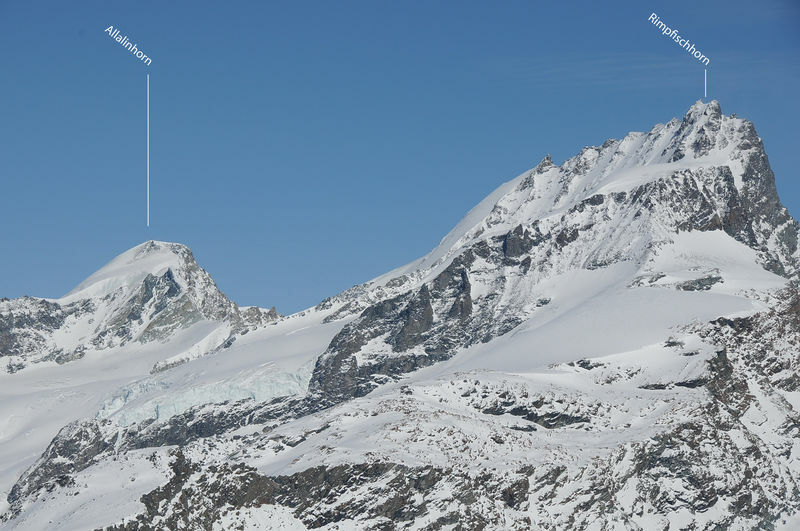 The Rimpfischhorn, with its jagged crest, is one of the peaks of the Mischabel massif, and lies to the east of Zermatt. It is a demanding summit for mountaineers, surrounded by magnificent glaciers. The Rimpfischhorn is regarded as a training peak for the Matterhorn: climbers who prove themselves here are ready to tackle the Matterhorn. 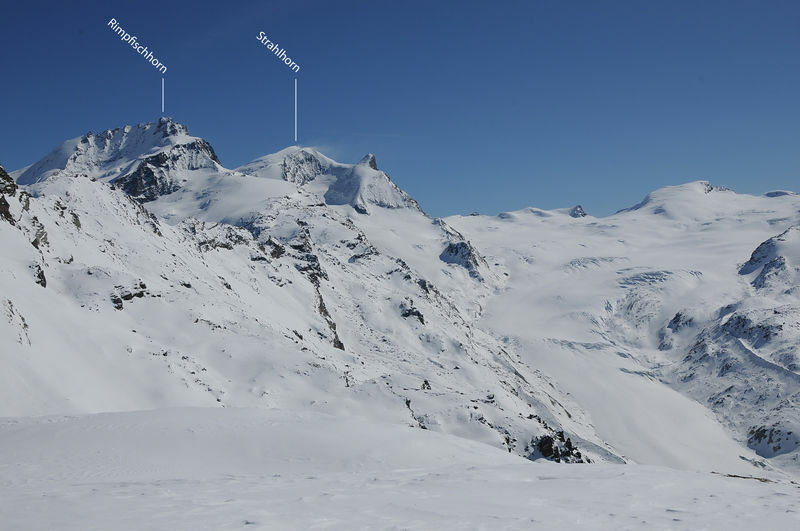 The extensive icy flanks of the Rimpfischhorn are clearly visible from the Gornergrat. 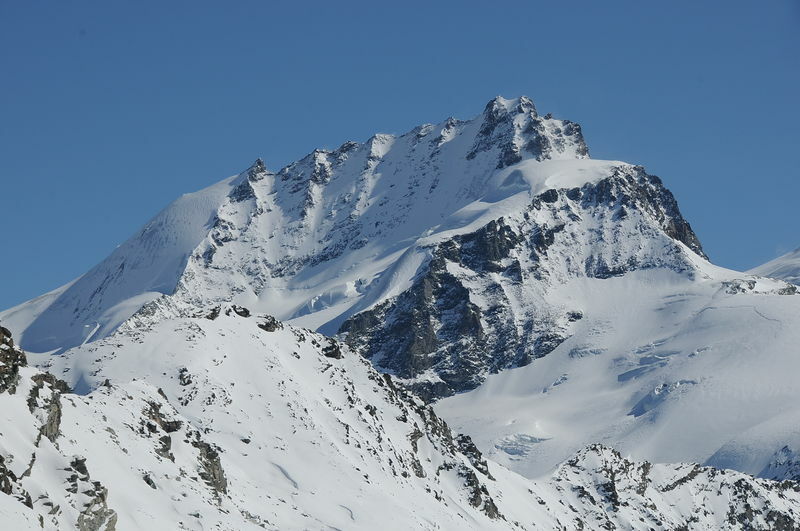 The Rimpfischhorn received its name (derived from “rimpfen”, to wrinkle) from its jagged north ridge. The summit cross on the Rimpfischhorn was carried up by the guardian of the Kin hut, Viktor Imboden, together with his younger son Iwan Imboden and Henry Willi. This was in memory of Viktor Imboden’s son Bernhard, who died in an accident in 1995 on the Roseg Glacier in Graubünden – on the last day of his mountain guide exams. The German photographer, painter and draughtsman Albert Siebenmorgen (1894–1978) was one of the oldest people ever to climb the Rimpfischhorn (1972). He was 78 at the time.